For 2019 myself, my dad and Jamie Park are all running the London Marathon. 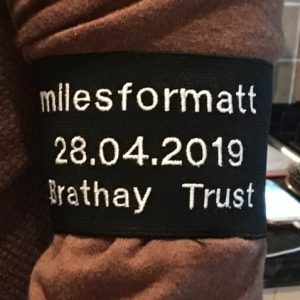 As a way of fundraising and also to commemorate Matt we are planning on making some black armbands with #finishformatt and the Brathay logo embroidered or printed. For all runners and supporters this would be a great way of showing their respect for Matt. Cost would be £5 plus postage, there is an additional donate option where you can add to the shopping basket if you’re feeling generous. Please note that to keep costs down we will need a significant number of orders before getting these made.